The community infrastructure levy (generally known as CIL) is a new charge that local planning authorities can levy on development to allow monies to be raised for infrastructure. There are two stages to the implementation of a CIL policy within Cornwall. The first of those stages is what is the charging schedule that will apply, i.e. how much will be levied, on what developments, and the rates for various geographical areas. The second stage is how we spend the money that is raised from CIL. That will be considered later this year. That will be subject to a report to Cabinet later in the year after suitable consultation and processing through the Economic Growth and Development Overview and Scrutiny Committee. The charging schedule has been through extensive consultation within the Council, with partner organisations, a public consultation and, importantly, examination by a government appointed inspector. 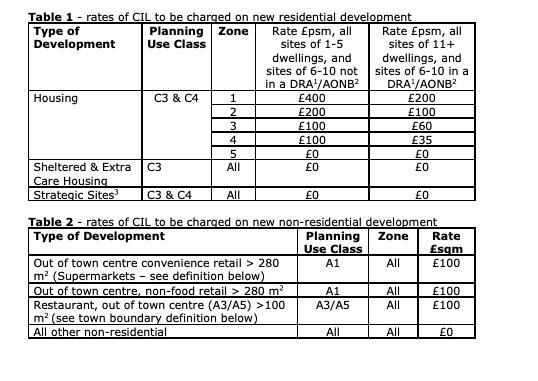 That process has resulted in the rates of CIL as detailed in the table below. Cabinet voted to support the proposed charging scheme. It will now go to Full Council to be ratified before taking effect from all planning permissions granted from 1 January 2019.